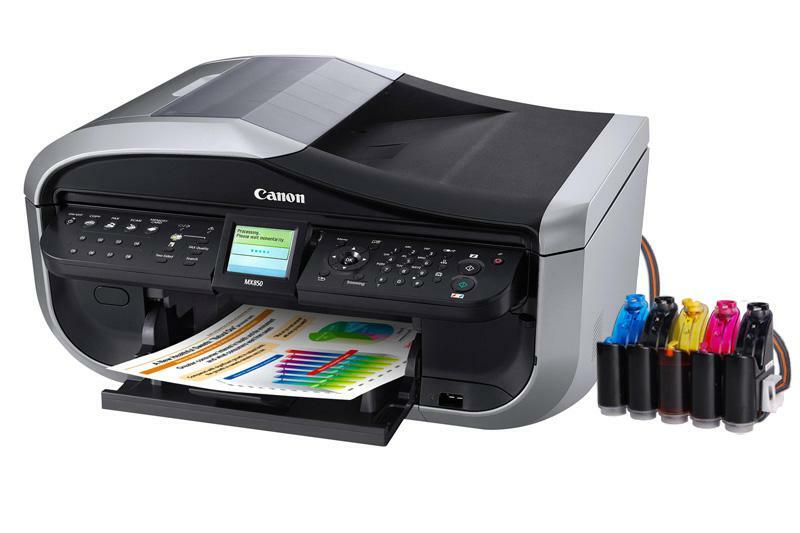 All-in-one Canon PIXMA MX850 with CISS - Inksystem - save money on ink! Buy All-in-one Canon PIXMA MX850 with CISS and make 30 times more quality prints for the same money! Pay only 0.04 USD for A-4 full color print! Print, Scan, Copy, Fax & 35 page duplex ADF. Camera, Memory Card, and Mobile phone direct printing with 6.2cm Colour TFT screen. CompactFlash ?, Microdrive, Memory Stick?, Memory Stick Pro?, SD Memory Card ?, MultiMedia Card?, MultiMedia Card Plus? and SDHC Memory Card. xD-PictureCard? ¹, Memory Stick Duo? ¹, Memory Stick PRO Duo? ¹, Memory Stick Micro? ¹, RS-MMC? ¹, miniSD Card? ¹, microSD Card? ¹, miniSDHC Card? ¹ and microSDHC Card? ¹.
Ethernet: IEEE802.3u (100BASE-TX), IEEE802.3(10BASE-T), 10/100Mbps (auto switchable). Bluetooth v2.0 Max speed 1.44 Mbps (HRCP for PC only) (with optional Bluetooth unit BU-30). ¹ Actual transmission speed may veary depending on document complexity, fax settings at receiving end, and line conditions. ¹ Colour document copy speed is based on default setting using "ISO/IEC 24712, Newsletter" (printed by off-set method) on plain paper. 10x15cm borderless photo copy speed is based on default setting using "ISO/JIS-SCID N2" (printed by silver-halide digital printing method) on 10x15cm Photo Paper Plus Glossy II.